Minnie's about to scare up some Halloween fun, trick-or-treating as a sweet-toothed vampire! One hand presents a jack-o-lantern bucket as the other extends her cape to showcase its quilted lining, hand painted in candy-pink hues to match the rosemaling details of Vampire Minnie's skirt. Sculpted from high-quality polyresin and calcium carbonate, with metal wire, the handcrafted Disney Traditions Violet Vampire Minnie Mouse Statue by Jim Shore will have you under its spell for many falls to come. 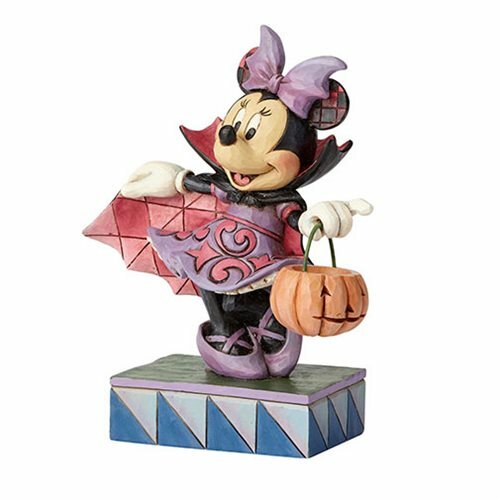 Collect this piece along with the Disney Traditions Colorful Count Vampire Mickey Mouse Statue (sold separately) for a spooktacular keepsake duo! Measures about 6 1/2-inches tall x 5 3/8-inches wide x 2 3/4-inches long.